Like the NBA teams that don a Spanish jersey for an evening, at CJSM we are getting our Spanish on. Our good friend and contributor to these blog pages and to the journal, Dr. Avery Faigenbaum, has agreed to sit with us for “5 Questions with CJSM.” We have been trying to catch up with him since his trip to Argentina this summer where he was lecturing on Exercise Deficit Disorder (EDD) and working on his own Spanish skills. I’m know he’s a lot better in that area than I am. Dr. Faigenbaum is a professor in the Dept. of Health and Exercise Science at The College of New Jersey. He has written about EDD in youth (“Thinking Outside the Sandbox”) and about the benefits and safety of resistance training in youth. He has lectured widely: I’ve heard him speak in various settings in the United States, and he’s set to speak to the American Academy of Pediatrics in 2014 on EDD. Catch him if you can, you’re sure to learn a lot and be entertained as well: his energy is infectious. 1) CJSM: With the recent award of the 2020 Olympic games to Tokyo, can you comment on any evidence out there that such events stimulate activity in young fans/viewers? Is there a ‘trickle down’ effect for youth athletics/exercise from events like the Olympics? AF: Last summer James Bond and the “Queen” opened the Olympic Games in London by jumping out of a helicopter. This was followed shortly thereafter by stellar performances from world class athletes including sprinter Usain Bolt, swimmer Michael Phelps, boxer Nicola Adams, and 23 year old Rosannagh MacLennan who started jumping on the trampoline at the age of seven. But in stark contrast to these remarkable feats of athleticism, physical inactivity among the world’s population is now recognized as a pandemic. Even if young boys and girls are nudged by their parents to participate in sports such as gymnastics and ice hockey, sedentary youth are typically “inefficient movers” because they have yet to gain the needed competence and confidence in their physical abilities to perform even simple motor tasks. As such, they do not have the prerequisite muscle strength and motor skill prowess to “succeed” in sports which require more complex movement patterns. The USA proudly hosted the 1996 summer Olympics and the 2002 winter Olympics, yet contemporary trends in youth physical inactivity and childhood obesity suggest our olympic-sized efforts to combat these public health concerns remain suboptimal. In 2010, Canada sent its winter games Olympic team to beautiful Vancouver. Even though they earned a record number of medals, the 2013 Active Healthy Kids Canada report card assigned a letter grade of “D-“ to the current status of physical activity among Canadian youth. And despite the notable efforts of Team Great Britain in 2012, recent findings from the Millennium Cohort study in the UK found that only half of 7 year old children achieve recommended levels of physical activity. Watching Olympic athletes compete in Sochi, Rio de Janeiro, Pyeongchang and Toyko may inspire a few out-of-shape kids to get off the couch, but if children are not exposed to daily physical activity and sport play early in life they will not be prepared for high-level competition later in life. Watching Olympic athletes compete is exciting and inspiring, but targeted interventions and aggressive public health initiatives are needed to activate the world’s youth. 2) CJSM: You just returned from an educational trip to Argentina. What were you doing down on the Pampas? AF: Professor Adrian Casas from La Plata University in Argentina invited me to be a guest lecturer at a sports medicine conference and teach a short course on pediatric exercise science. At present, 19% of youth in Argentina are obese and data on type 2 diabetes are starting to reflect trends in the USA. Rapidly changing dietary practices and increasingly sedentary lifestyles have caught the attention of Argentine researchers, clinicians and government officials. Although my lectures and practical sessions targeted physical education teachers and youth coaches, I also had an opportunity to interact with Argentine physicians. While they remain concerned about emerging trends in childhood obesity, it seems they are facing the same challenges as health care providers in the USA. That is, an environment characterized by fast-food, unsafe plays areas, and parents who may not understand the devastating consequences that await their young child who is inactive and obese. 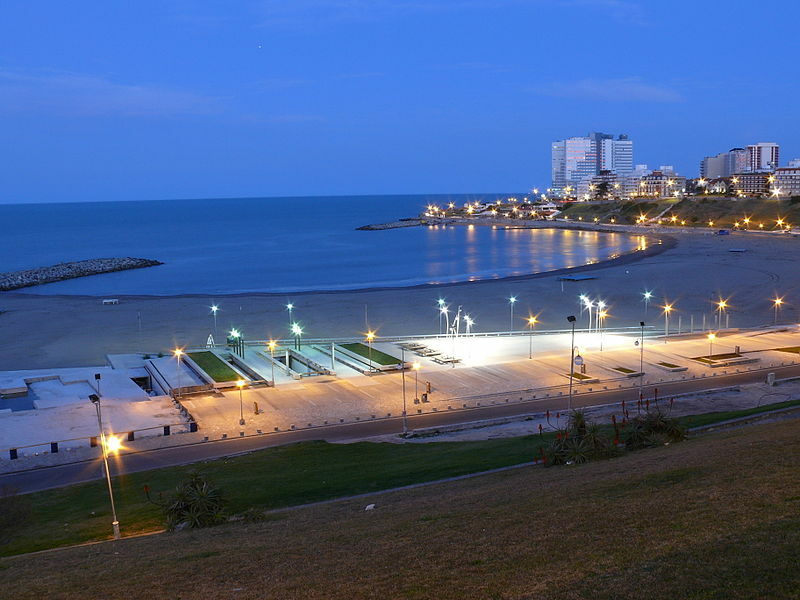 A beach scene in Mar del Plata. with you next time you go! I also had the privilege of meeting Cristina Di Rado who is a senator from Mar del Plata in Argentina. Senator Di Rado is well-known for her commitment to important social issues related to childhood health and wellbeing, and is keenly aware of the importance of addressing the growing epidemic of childhood obesity. Despite her busy schedule, she stayed for a full-day session on pediatric obesity and shared her political wisdom on how we can best tackle this growing public health concern. While there is much work to be done, my sense is that heightened awareness about physical inactivity and childhood obesity may be a catalyst for policy change in Argentina. 3) CJSM: We know you have just begun to tip your toes into the world of social media (e.g. twitter). If you had to compose a 140-character tweet to describe what ‘Exercise Deficit Disorder’ is, what would it say? AF: Physical activity, like cigarette smoking, is learned behavior and therefore we need to expose children to environments that enhance both health- and skill-related components of physical fitness before they become resistant to our interventions. Yet recent epidemiological reports indicate that modern-day youth are not as active as they should be and the decline and disinterest in physical activity seems to start early in life. First of all, physical activity is being eliminated from the school day. We chauffeur children everywhere and daily physical education is only offered in 4% of elementary schools in the USA. Due to budget cuts and lay-offs, after-school sports and recreation activities are limited in some school districts and parents are understandably concerned about safety at parks and playgrounds. Next, technology has eliminated the need to move (at least the large muscle groups). Surfing the internet has become a popular “sport” among school-age youth and “speed texting” competitions on touchscreen keyboards is part of the new generation. While thumb dexterity may be improving, children are not learning, practicing and reinforcing fundamental movement skills. Lastly, most health care providers lack formal training in pediatric exercise science and are ill-prepared to prescribe age-related exercise for young patients. Even though the well-child visit was designed to assess a patient’s health, screen for disease, and provide anticipatory guidance, there seems to be a missed opportunity for practitioners to evaluate a child’s exercise habits and, if appropriate, prescribe a daily exercise regimen as part of transportation, play, recreation, or sport. on this young man’s form? AF: In 1990 I was working on an idea for my doctoral dissertation. 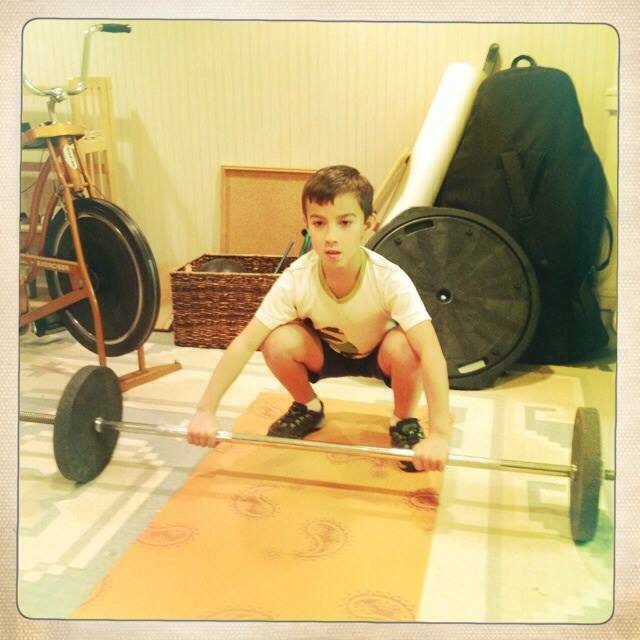 While I was always passionate about teaching and coaching youth, my doctoral advisor encouraged me to pursue my interest in pediatric resistance training. At the time, this topic was somewhat taboo, but we decided that the controversy surrounding the safety and efficacy of youth strength training would make my dissertation interesting, informative and worthwhile. My first challenge was to find a local facility to strength train a group of preadolescent boys and girls. Fortunately, I met Dr Wayne Westcott who was the Fitness Director at the South Shore YMCA in Quincy MA (about 20 min south of Boston). After a 30 minute rant on my research goals and methods, Dr Westcott looked at me and said “when can you start?” I didn’t realize it back then, but those 4 words (or nowadays it would have been a 20 character tweet!) had a huge impact on my professional career. With indispensable support from Dr Lyle Micheli at Children’s Hospital in Boston, I successfully defended my doctoral dissertation and continued a series of pediatric research studies at the South Shore YMCA for the next 10 years. Although I am no longer in Boston, I continue to collaborate with Dr. Westcott and Dr. Micheli as we aim to shed more light on a variety topics related to pediatric exercise science, sports injury prevention, and preventive medicine. Thanks Avery so much for your time, we’re looking forward to hearing about EDD some time in the pages of the journal itself!! And to our readers, tell us what you think about #ExerciseDeficitDisorder @cjsmonline on Twitter or in the Comments below. Senor Faigenbaum: La próxima vez, vamos a estar llevando a cabo la entrevista en español! Probably my favorite lecture ever was Dr. Faigenbaum’s when he visited Nationwide Children’s. Go see him when you can! Agreed Brian! So much information, so many provocative idea, and so much energy!